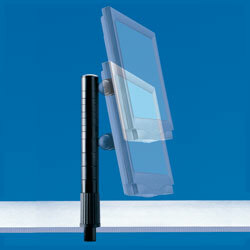 The Axcess Height Adjustable LCD Monitor Arm is a cost effective way to increase usable space on your work surface. The arm simply clamps onto the edge of your desk or table with a 1/2" to 3" thickness using a hand-tightening adjustable c-clamp (1" overhang needed for stability). Your monitor is easily mounted to the arm with VESA 100 and VESA 75 compatibility and can be tilted forward and back for optimum ergonomic viewing. The arm can support monitors up to 19" in size, allowing a full 360 degrees of viewing rotation and comes with cable management clips. 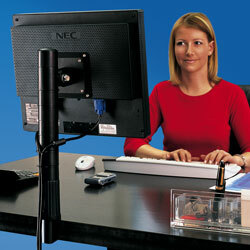 7-position vertical height adjustability allows you to raise or lower your monitor in 1-3/8" increments from desk level to almost an entire foot above your work surface (actual height depends on the size of your LCD monitor).